Do you have a dessert that just takes you right back to your childhood? One bite of these Gooey Bars and I am eight years old sitting at my Aunt Maria's kitchen table. They just taste like summer to me. They aren't particularly summery (in fact they are quite rich and heavy for the heat of summer), but since my aunt is a teacher, that is probably when she had time to make these. Is there anything like the pure, unadulterated joy of eating a dessert with absolutely no concept of what is in it or how bad it might be for you? Maybe that is why these remind me of being eight. Because back then I didn't realize that what makes Gooey Bars so amazing is the combination of butter, cream cheese, powdered sugar and yellow cake mix that goes into them. Are your arteries hardening yet? Until a few years ago, I truly believed that these decadent little bars of goodness were a special family recipe. I had no idea that anyone else had ever heard of them or that a similar recipe was in Paula Deen's The Lady & Sons Savannah Country Cookbook . I guess at eight years old, it really did seem realistic to me that my mom and my aunt were the only two people in the world who made Gooey Bars. 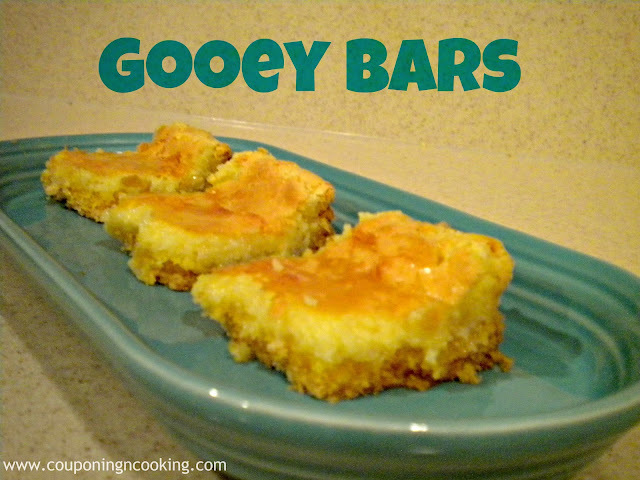 I have never met anyone who didn't like Gooey Bars. Even though they are intensely sweet, you can't stop eating them. Even though you know you shouldn't. Even though your blood sugar levels spike just smelling them. Even though there really isn't any good excuse to pour cream cheese and powdered sugar over yellow butter cake batter and bake it. But you will. And you will love it. A few notes, if you want to make the best possible version of these bars you may want to keep in mind a few things. I find that the butter recipe yellow box cake mix is the best type to use. I also find that using lower fat or substitute versions of the butter and cream cheese cause the bars to bake up weird and to not develop that light and fluffy texture that makes them so amazing. When they are baking the top crust may puff up and start to look too browned or burned. You want to make sure not to take them out of the over too early or they won't be cooked all the way through and will be too gooey and runny to cut and eat properly. Believe me I have learned that the hard way. I am completely paranoid about over baking desserts but I have learned to be patient on these. 1.) 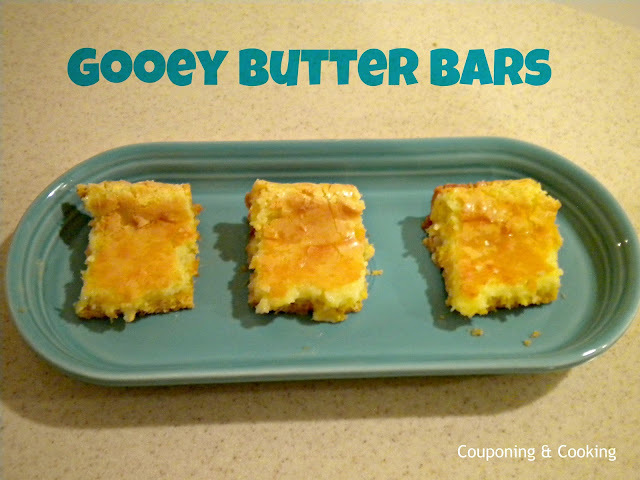 To create the base for the Gooey Bars, you will need to beat together the butter, cake mix (just the mix) and one egg. I microwave the butter first so it is pretty softened but not completely liquid. 2.) Lightly grease and 9x13 pan and press the cake batter mixture evenly into the bottom. 3.) Next, beat together the softened cream cheese and remaining two eggs and vanilla. Once they are well combined slowly beat in the powdered sugar until the mixture is smooth. 4.) Pour the cream cheese mixture evenly over the cake batter. Bake at 350 degrees for about 30 minutes. You want it to be cooked all the way through. The top layer will look flaky and crusty. 5.) Let them cool completely before trying to cut them. Easier said than done, I know. For nutritional information click the Recipe Magic button below! I've gotten the Paula Deen version of this at Walmart, but I bet the homemade version is so much better! Thanks so much for linking up! I've never tried gooey bars before, but they seem really popular. Yours look fantastic! Oh, those sound delicious!! What a fun treat. Thanks so much for sharing these with us as well at Thursday's Temptation. Living in the STL - we love us some gooey butter cake! These look fantastic! Thanks for sharing at the Pomp Party! Pinning to our Pomp Party board! Love these! Thanks for linking up at Heavenly Treats Sunday! Thanks for the recipe. I love these things! Wow, do those ever sound and look delicious! Thanks for linking up at Shine on Fridays! That looks so darn gooey and yummy Kaylee! This looks delectable. It reminds me of a gooey lemon cake recipe my grandma had. Thanks for sharing on BeColorful. These look so good and I love how easy they are to make. Thanks for sharing at Showcase Your Talent Thursday! These look super yummy! 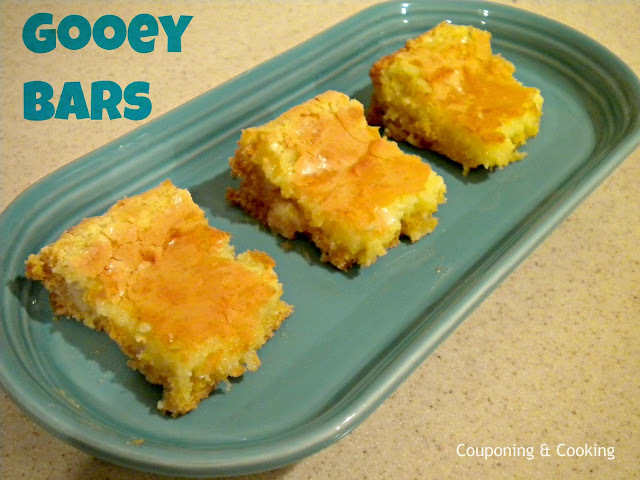 I've tried Paula Deen's Pumpkin Gooey Bars, so I know I'd love these too. Thanks so much for sharing at Terrific Tuesdays. You know when some recipes just intrigue you? This is one of them! I have never seen anything like it. Thanks for linking up at Fantastic Thursday at Five Little Chefs. Hope to see you there next week! Wow, these look so wrong and soooo right at the same time! I believe you when you say that my blood sugar will spike just smelling them because I think it did just by imagining that sweet, delicious smell! I cannot wait to try! I wonder if gooey bars are a southern thing because I have never heard of them until now. But I can't wait to try them! Thanks so much for sharing on Tout It Tuesday! 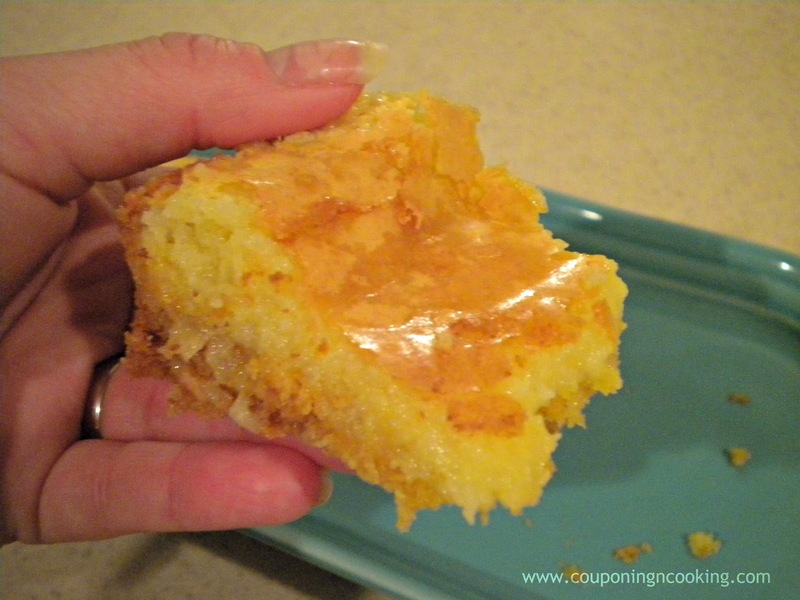 I use a lemon cake mix and 1 cup chopped pecans in the crust.I call them lemon bars.They are awesome wish I had some NOW!